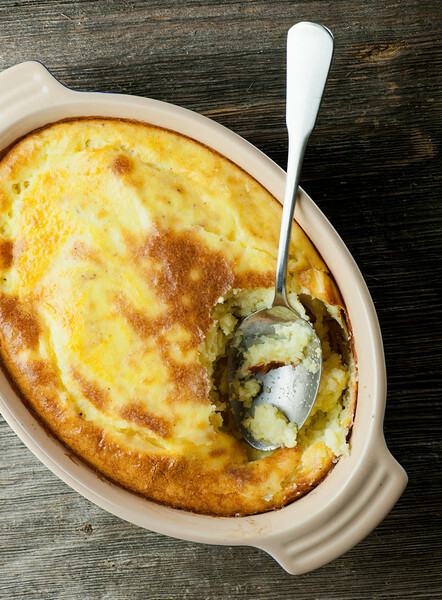 Put an easy, crispy spin on regular mashed potatoes with this baked version! Baked mashed potatoes for Thanksgiving, maybe? Yes! Hi, all my friends out there racing around making Thanksgiving plans! As someone who has both thrown and attended many wonderful holiday dinners of all kinds, I know that one of the challenges is trying to get all those delicious dinner items ready All At The Same Time. And while I am still a devoted fan of regular mashed potatoes, one of the fabulous things about this baked variety is that you can make ’em ahead and bake ’em later…as is, right next to the turkey. Which saves you from trying to assemble that umpteenth thing alongside the gravy and creamed onions and peas and carrots and on and on and on. You’re going to find all the usual ingredients in this recipe…potatoes, milk, butter and the one thing I ALWAYS toss into my mashed potatoes, cream cheese (trust me! ), but since these are going in the oven and we want them to be their usual creamy selves, I also mix in some eggs. They give the potatoes just the right amount of beautiful consistency. The other thing I love about this recipe that you don’t get with regular mashies is that crispy bit right on the top. You’re going to bake these up until they get just a bit golden on the top, which gives a tiny bit of crunch just to that top part – kind of like shepherd’s pie. Yum and yum and yum again. So if mashed potatoes are on your Thanksgiving horizon, or if you are just looking to mix things up for any meal mashed potato-wise, try this baked version. Happy mashed potatoes! Peel the potatoes, cut them into chunks and place them in a large pot. Cover them with water and bring the water to a boil. Turn the water down to a simmer and cook them until they are tender, 10-15 minutes (test them by sticking a knife into one of the chunks – it should give easily). Drain and return to the pot. Add the butter and sir until well incorporating. It’s important to add the butter before any of the other ingredients for the very best mashed potatoes! Stir in the cream cheese, and then pour in the milk in 1/4 cup increments until the potatoes are the consistency you like. Season to taste with salt and pepper. Stir in the beaten eggs, and then spoon the whole thing into a buttered casserole dish. Bake at 375 for 30 minutes or until the potatoes are golden on top. Cool for 5 minutes and serve! I’m actually not usually that into mashed potatoes…but with a crispy top…that’s a gamechanger. Yes, crispiness in most things is irresistible!! Can these be made the day before and then baked on thanksgiving? Absolutely! Just let them come to room temp before you bake them. I made this tonight and it was amazing! I added bacon and some cheese on top at the very end and let it melt over it, but the potatoes themselves were amazing. I will be keeping this recipe on hand for the future! :) Thank you for sharing it!